The Book Club at the Carver Public Library meets on the third Wednesday of each month at 2:00 in the Small Meeting Room. 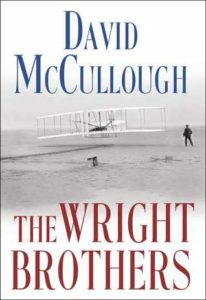 Our book for November is The Wright Brothers by David McCullough. “On December 17, 1903 at Kitty Hawk, North Carolina, Wilbur and Orville Wright’s Wright Flyer became the first powered, heavier-than-air machine to achieve controlled, sustained flight with a pilot aboard. The Age of Flight had begun. How did they do it? And why? David McCullough tells the extraordinary and truly American story of the two brothers who changed the world.” Everyone is welcome including newcomers and refreshments will be served.